The sword and halo was a device worn by those in Dontoria Hivesprawl who slew a heretic from the infamous Death Guard legion. Trained extensively in close-quarters warfare and veterans of a dozen city fights, the Necropolis Hawks are stoic and efficient in their warfare. They bear their battlefield role insignia upon their backpacks as well as their pauldrons so their comrades can identify them even in the smoke and dust of urban war. 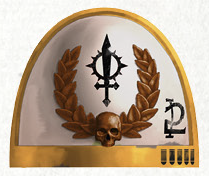 On Vigilus, the Necropolis Hawks turned the tide against the xenos insurrection and Gellerpox infection that rocked Dontoria to its foundations. Taking control of the city building by building, they established several safe zones that were expertly defended - and pitilessly demolished those that they considered lost causes.